SECOND ANNUAL CHETNIK FAMILY REUNION COMING UP ON SEPTEMBER 19, 2015 IN CLEVELAND, OHIO! They say that during the 1990s alone more than 300,000 young and educated people left Serbia. This factoid has never been confirmed, nor does anyone know exactly how many of these émigrés subsequently joined Serbian Diaspora organisations or how many still have not forgotten their native country. Given that Serbia receives 3-4 billion euros in donations every year from émigrés and that since the 1990s there have been countless convoys of humanitarian aid, the true figure is by no means small. A fine example is this group of young Serbian émigrés in London, who back in 2006 while their own legal status in Britain had not yet been resolved, nevertheless began methodically collecting humanitarian aid for northern Kosovo and Metohija. At the same time, they contributed to many Serbian events in London and the surrounding area, they visited old Chetniks and offering help, recorded their stories on video cameras, etc. To begin with, they dubbed their group Trojstvo (Trinity) and then Majka devet Jugovića (The Mother of nine Jugovićs). 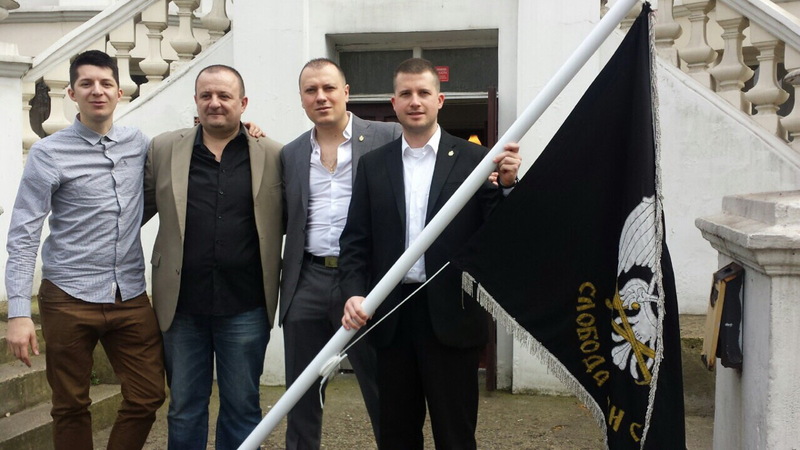 This year they became members of the Movement of Serbian Chetniks of Ravna Gora in Great Britain bolstered its ranks. ThePokret in Britain was established by Vojvoda Momcilo Djuic in the 1950s and has since become the strongest and best organised of the Serbian emigre organisations on the island. Most active in this group of young Serbs are Milisav Marković, Miroslav Milenković, Marko Vučenović and Daniel Batica … During the past year they organised three successful screenings of the documentary TV series “Kingdom of Yugoslavia in World War II” at the Hotel Ravna Gora in London where they have always been welcomed enthusiastically by hotel manager Miroslav Veselinović as indeed by the management of the Pokret, headed by President Momčilo Babić. In a word: Guys, congratulations!